Have a tee-riffic time when you move and groove with Barney(TM) and his friends! Join Barney and learn many different types of dance, from hip-hop to ballet to folk dance and more, and watch as his friend Jamal builds the confidence to give them a try too! 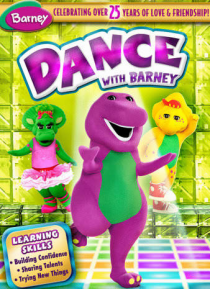 Then Barney and his friends explore movement and have a ball as they wiggle, waddle, hop, and bop together! Don't miss a beat and come along fo… r a dino-mite, dino-dancing good time!